Club Sunday’s are an informal paddling session open to all members that have completed a beginners course with the club. There’s no formal coaching, but there is a coach on hand to co-ordinate the session. 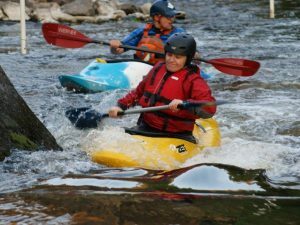 Paddling depends on who is there and water levels, but could include a paddling on the flat or white water at the club, or a short trip up the canal and back down the river. If river levels are high the session may be on the canal.